Minnesota’s grouse season is about to start and I have been going through some of my pre-season rituals. My first ritual is to get the boots oiled up. Part of the process is checking over the old boots for holes, tears, and other damage. 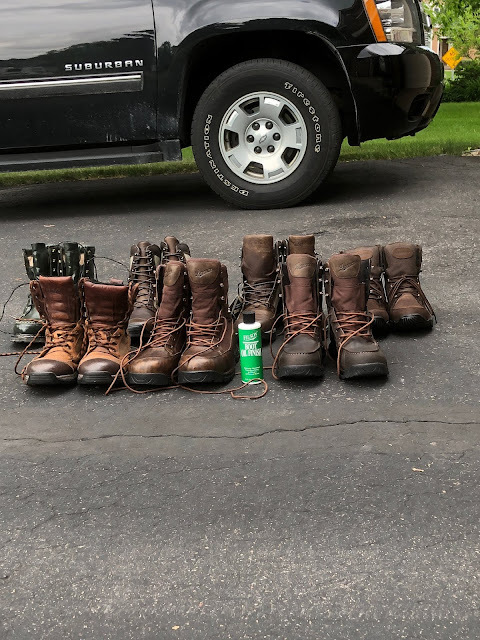 It is also a chance to get any new boots ready to be used during dog training so they have a least some time on the ground before the season opens. My second ritual is hitting the farm for some preseason work with the dogs. I live in the suburbans and my dogs are walked on a leash and spend their outside time on a cable as our yard doesn’t have a fence. These work outs gives the dogs a chance to work on their fitness as well as their range of motion. They get enough walks so they aren’t too out of shape but the running through the fields gives them the opportunity to stretch and move in ways that more closely replicates hunting. The time at the farm also gives a chance to try out new products and to make sure that the current tools made it through the winter ok. I fire up all of the dog tracking and training devices, test out the GPS devices, and make sure the vests, pants, and coats are all still fit and are ready to go. I have some others but it is time to start to put he gear together for the opener. Have a good hunt.